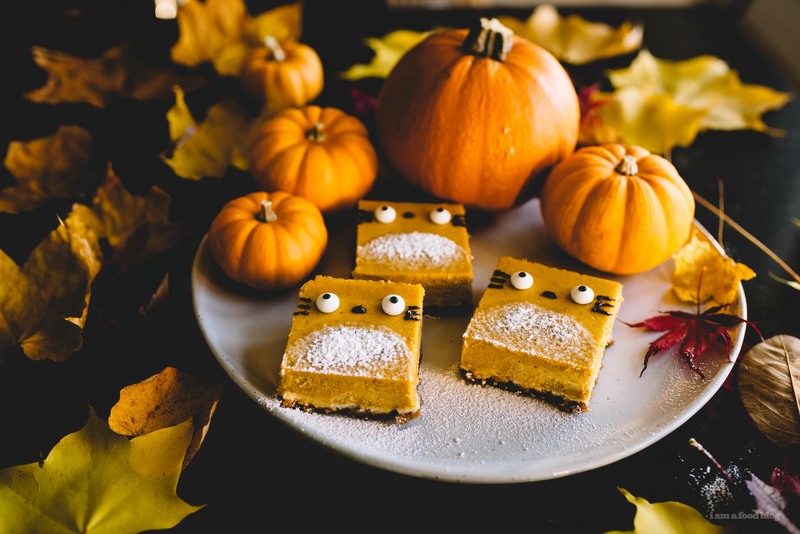 Pumpkin cheesecake bars: all the flavors of pumpkin pie, in cheesecake bar format. Bonus, they dressed up as Totoro for Halloween! We had a power outage last week and it was a.) spooky b.) kind of fun and c.) worrisome. Spooky because the hallways were dark AF and we wanted to leave the house so, we used our phone flashlights to light the way down the super dark hallway, slightly creepy (only because no one ever uses them) stairs, into our car park. 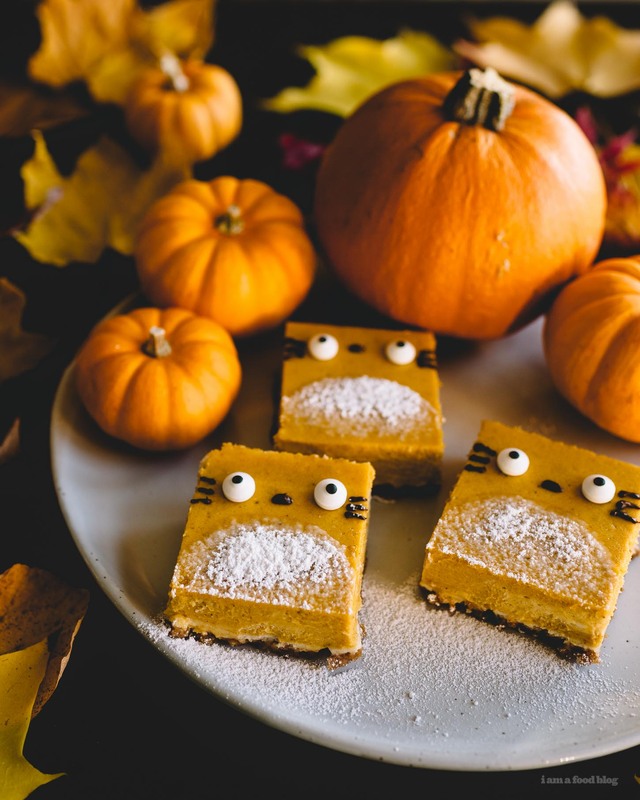 From there, it was a breeze and we had an excellent day out, but I was a little worried about the fridge because the day before the power outage, I made a sheet of pumpkin cheesecake that was destined to be Totoros! Turns out that I didn’t need to worry because Mike was smart and told me not to open the fridge at ALL so when our power went back on, everything in the fridge was super cold still. 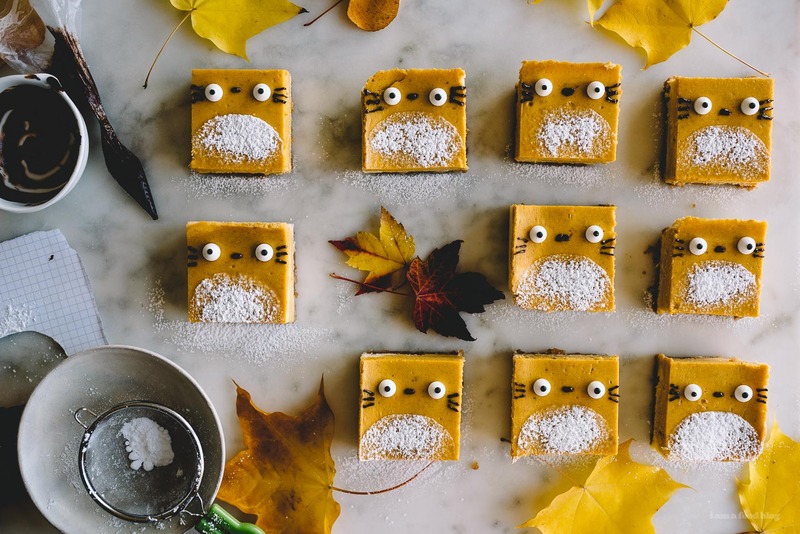 So, we can thank Mike for the cuteness that is Totoro cheesecake! I was especially excited about making these because not only is it Totoro shaped, it’s also seasonal because October/fall is all about the pumpkin stuff. Plus orange Totoros are too cute. 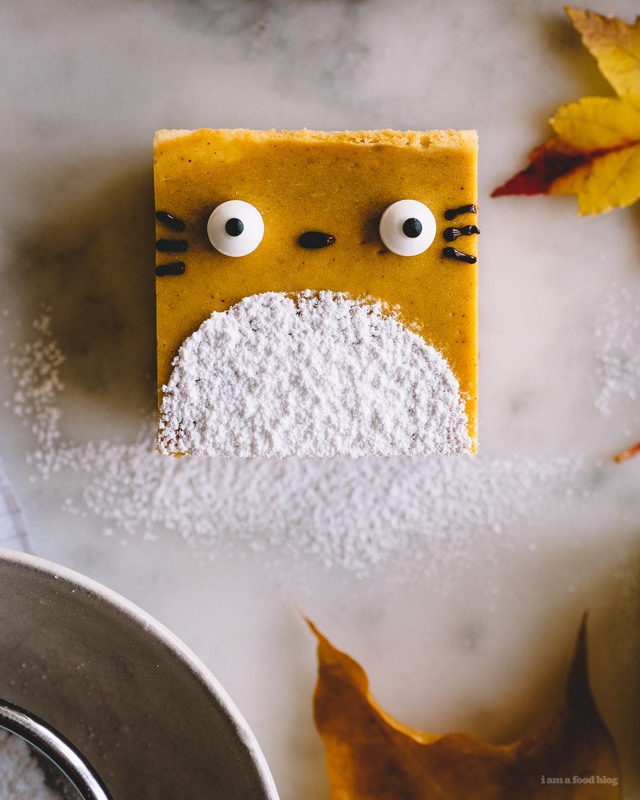 They’re pretty easy to make too, just a light dusting of icing sugar for his belly, and then some candy eyes, and a chocolate nose and whiskers. I recently found candy eyes and I’m obsessed. I want to put them on EVERYTHING! Anyway, hope you have a wonderful weekend! Please check out these other awesome Totoro posts too! I’ll be rounding up ALL the Totoros soon, and I’m doing one more post, so stay tuned! 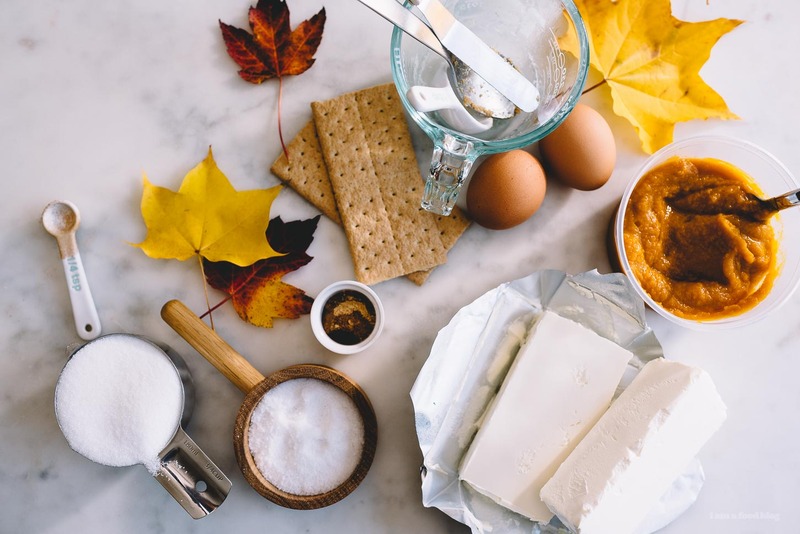 Whisk together the graham cracker crumbs and sugar. Drizzle in the butter and combine. Line a baking sheet with parchment paper, leaving an overhang so you can later lift your bars out. Press the crumbs into the baking dish. I used a 8 x 10 inch tray, this will also work in a 9×9 square. Bake the crust for 12-15 minutes, or until it starts to brown at the edges. Cool on a wire rack while you make the cheesecake. Beat the cream cheese until light and fluffy and very smooth, about 2 minutes on medium. Slowly add the sugar and keep beating, until incorporated. Beat in the salt. Scrape down the sides of the bowl and add in the eggs, one at a time, incorporating fully after each egg. Mix in the pumpkin and pumpkin spices until just mixed. Pour the mixture onto the prepared crust and bake until edges are set, but center is still slightly jiggly, about 40-50 minutes. Cool on a wire rack for 2 hours, wrap tightly and chill overnight in the fridge. Use the parchment paper to life the bars out and slice into squares. To make Totoros, dust the bellies with icing sugar. I cut out a round stencil to keep the sugar from going everywhere. Pipe on his eyes, nose, and whiskers. Enjoy! Make sure you dust the bellies right before you need to see your Totoro, otherwise the icing sugar will dissolve on the surface of the cheesecake. You can also pipe on a white chocolate belly, if that’s more your thing. 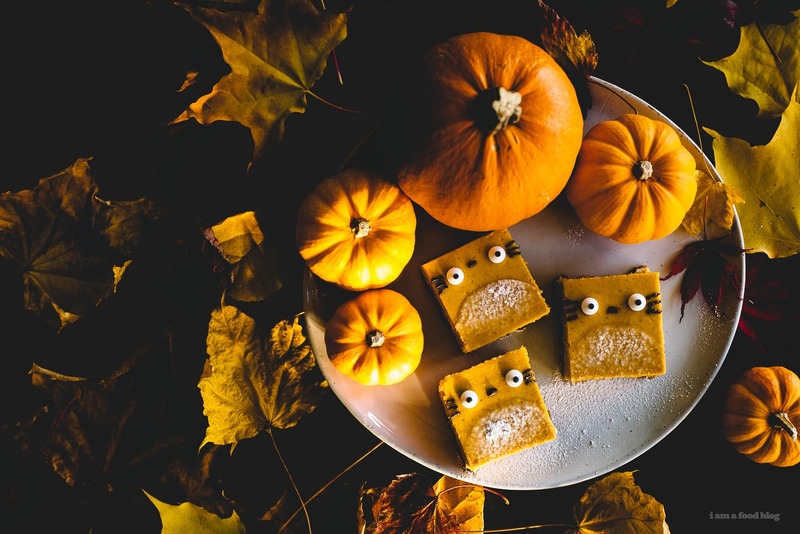 These are maybe the cutest lil pumpkin treats of all time. 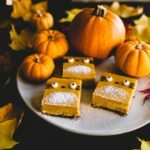 LOVE the pumpkin cheesecake combo, and the presentation here just melts my heart! cheesecake for breakfast sounds perfect! Made these for my husband’s birthday and they’re definitely easy and cute!!! The pumpkin cheesecake itself is sooooo yum. Would probably be one to keep in the repertoire.